Friday March 21st 1879. Weather somewhat pleasanter. I sewed all day and evening made three pair ruffled pillow cases. Aunt Mellissa was here for dinner she was going away in the evening train. Mother walked to town with her in the afternooon. Had word from Rob they may be home tomorrow. 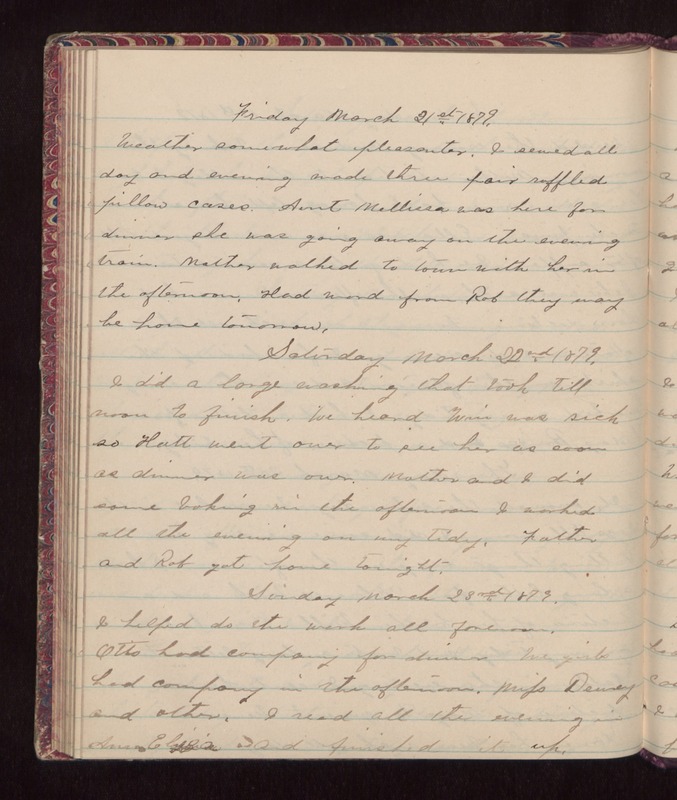 Saturday March 22, 1879. I did a large washing that took till noon to finish. We heard Win was sick so Hatt went over to see her as soon as dinner was over. Mother and I did some baking in the afternoon I worked all the evening on my tidy. Father and Rob got home tonight. Sunday March 23rd 1879. I helped do the work all forenoon. Otto has company for dinner. We girls had company in the afternoon, Mifs Dewey and others. I read all the evening in [Anna Eliza?] and finished it up.